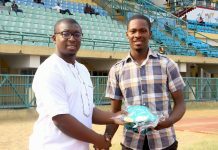 The men’s 200m final was the last event on Day 1 of the ongoing Athletics Federation of Nigeria (AFN) Golden League holding at the Abuja National Stadium. However, it turned out to be the highlight of the day as reigning National 200m Champion Emmanuel Arowolo smashed his Personal Best (PB) set while winning the final at the Commonwealth Games Trials (20.96s). It was evident from the way he attacked the curve and the home straight while competing in Heat 1 of the 200m on Friday, that Arowolo was a man on a mission, and that he was running for time. 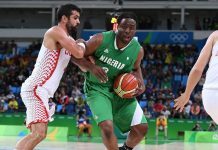 The fans at the stadium erupted in cheers and applause as the clock stopped at 20.84s, before it was rounded up to 20.85s. Emmanuel Arowolo ran for time and was rewarded with a Personal Best of 20.85s in the men’s 200m. “I want to thank God because it hasn’t been easy. 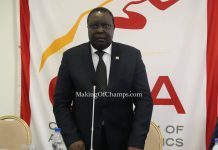 I also want to thank the Sports Ministry for giving me this opportunity to be in camp with the national athletes going for the Commonwealth Games. It has been a privilege training with some of these great athletes. I want to thank my coaches who have really tried to improve on my form and endurance also. I’m really happy about this time this evening. 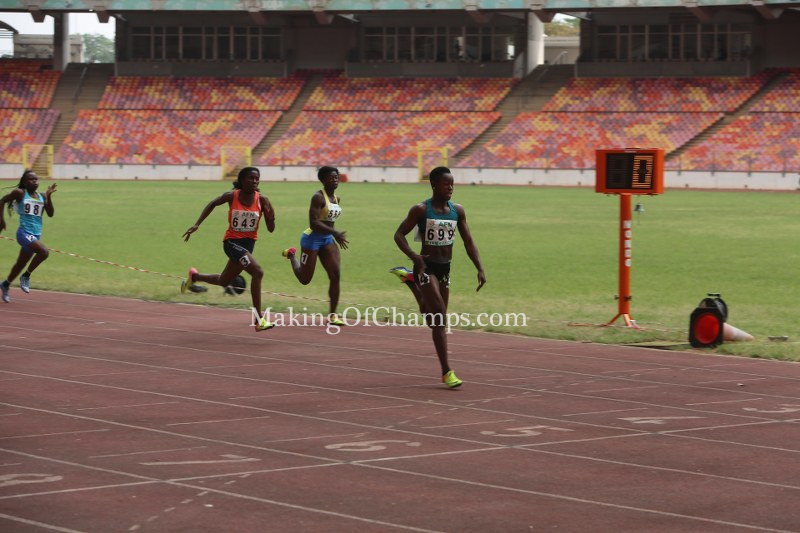 Godwin Ashien (21.93s), Ogho-Oghene Egwero (20.99s), and Usheoritse Itsekiri (21.66s) won Heats 2, 3 and 4 respectively of the men’s 200m. 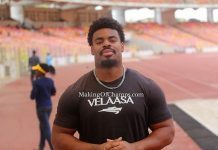 Patience Okon-George comfortably won her 200m heat on Day 1 of the Abuja Golden League. 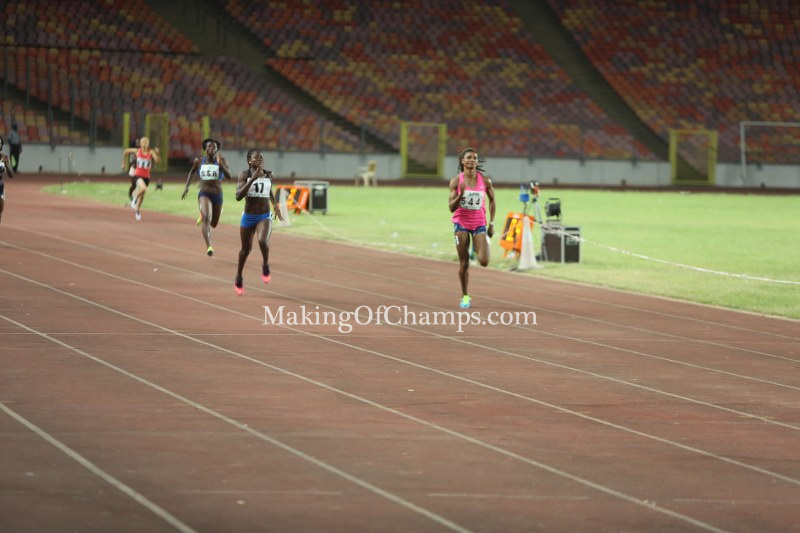 Isoken Igbinosun dominated Heat 1 of the women’s 200m where she clocked 23.52s to finish ahead of Joy Udo-Gabriel (24.50s). Three-time National 400m champion Patience Okon-George won Heat 2 in 23.57s, while Rosemary Chukwuma followed in 23.63s. 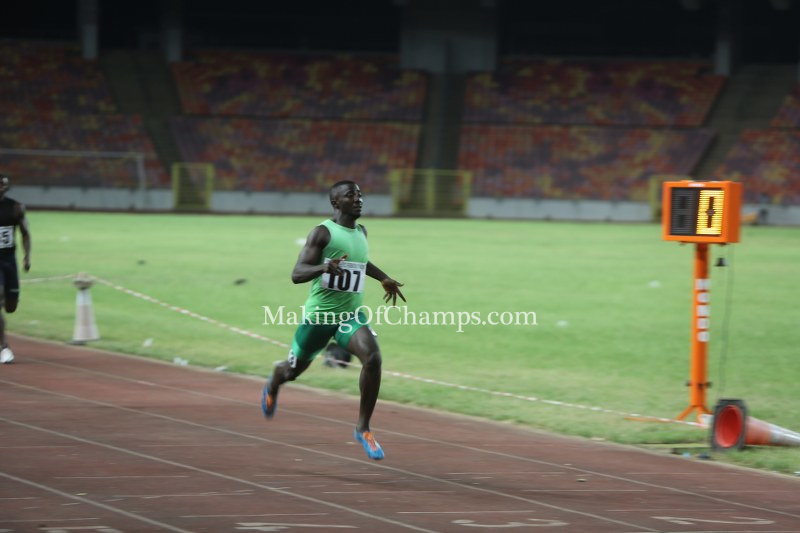 In other events, Egwero ran the overall fastest time in the men’s 100m heats, returning a time of 10.40s. Reigning National Champion Seye Ogunlewe clocked 10.55s to win Heat 2 while Idjesa Uruemu raced to victory in Heat 1 in a time of 10.64s. Arowolo was the man to beat in Heat 4 where he posted a time of 10.57s. 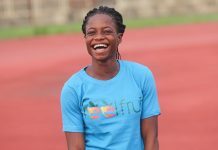 Blessing Ogundiran outclassed the rest of the field to win Heat 1 of the women’s 100m in 11.58s, while MoC’s Udo-Gabriel finished ahead of Grace Ayemoba to win Heat 2 in 11.80s. Mercy Ntia-Obong took Heat 3 in a Season’s Best (SB) of 11.71s. 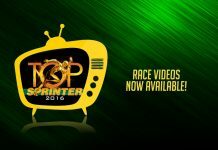 Team Blessed’s Blessing Ogundiran ran the fastest time in the women’s 100m heats. In the women’s 400m, Folashade Abugan qualified for Saturday’s final after winning Heat 1 in 53.81s, while Yinka Ajayi raced to an SB of 52.24s in Heat 2 to finish ahead of MoC’s Ifunanya Muoghalu. 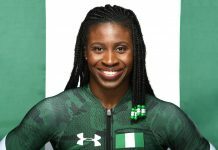 Praise Idamadudu clocked a PB of 52.84s in Heat 3, while Oluchi Offorma who placed 2nd in the race, also qualified for the final with her time of 55.57s. 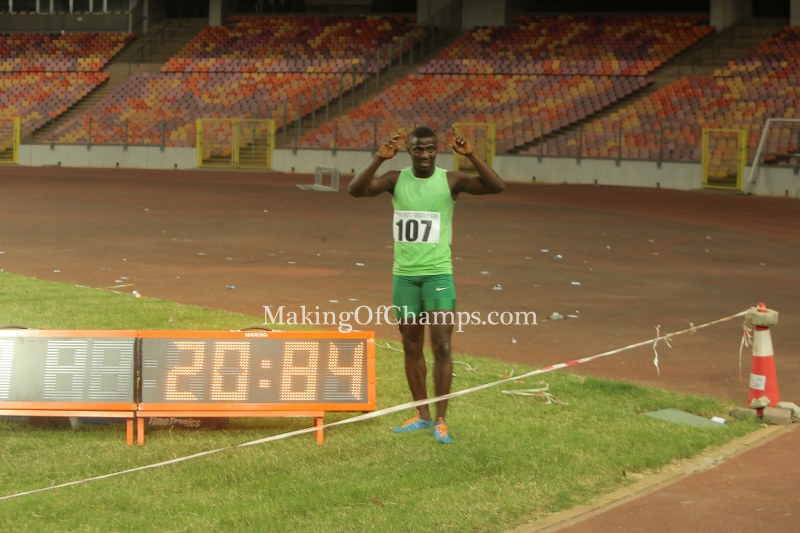 Sikiru Adeyemi was the man to beat in Heat 1 of the men’s 400m where he clocked 48.06s to book his place in the final, while Gerald Odeka returned a time of 48.47s to win Heat 2 ahead of Kenechukwu Ayadegbu (48.51s) who also qualified for the final. Youngster Habib Suraj sped to a PB of 48.41s to beat Nazifi Mohammed (48.67s) in Heat 3. 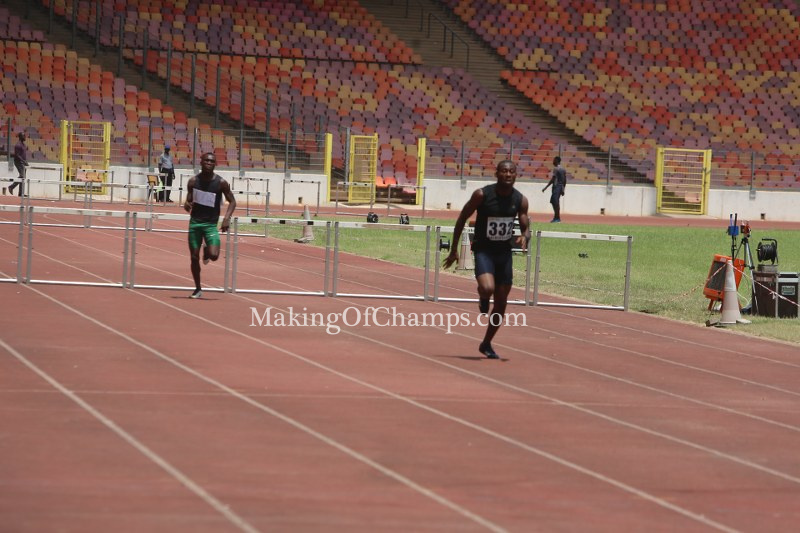 Henry Okorie of Nigeria Customs extended his winning streak this season by claiming victory in the men’s 400m Hurdles in 52.40s. 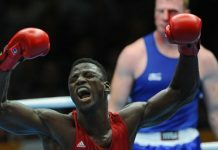 However, his closest challenger David Olowookere clipped on a hurdle and fell, and Did Not Finish (DNF) the race. 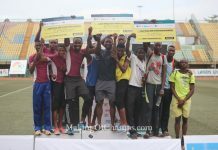 Timothy Emoghene and Edidiong Udoh placed 2nd and 3rd respectively. 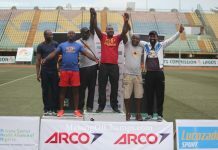 Henry Okorie easily won the men’s 400m Hurdles at the Abuja Golden League. Rose Akusho continued her dominance in the 5000m which she won in 17:38.16, while David Musa won the men’s 3000m Steeplechase in 8:17.24. 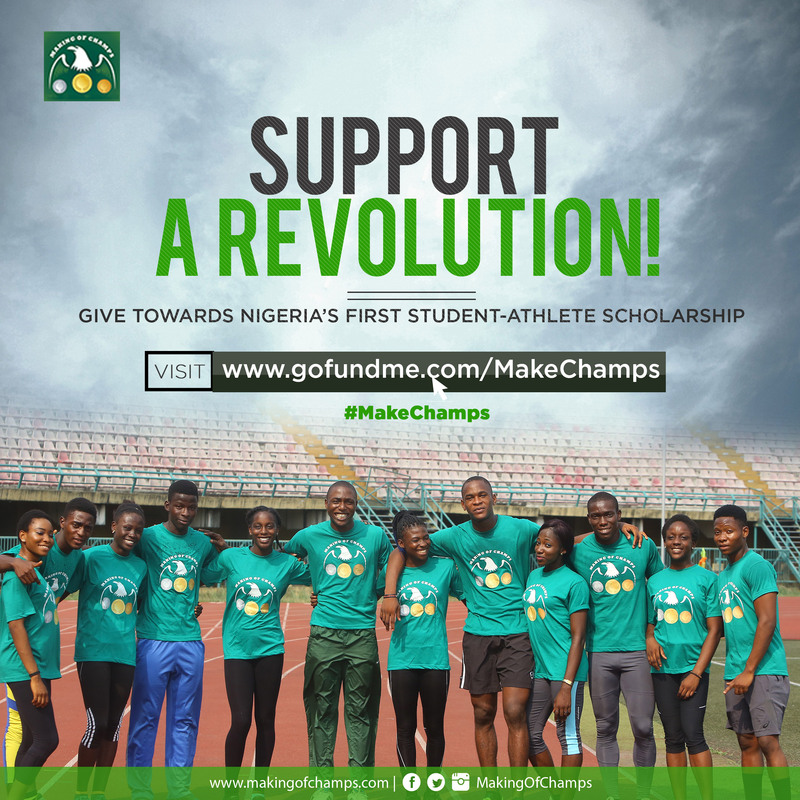 National Record holder Queen Obisesan maintained her impressive run this season, winning the women’s Hammer throw with a distance of 66.15m, while Precious Okoronkwo won the women’s Long Jump with her leap of 6.16m. 3000m steeple Musa 8:17.24 is not possible. Definitely one lap short!